We began our second cohort of EMPWR on September 10, 2018! EMPWR is a 20-week, 40-contact hour program created by Released and Restored to address the unique needs of incarcerated women. More than 80% of incarcerated women have experienced repeated physical, emotional, or sexual violence throughout their lives. This type of repeated trauma greatly reduces a woman’s sense of her own worth and value. the threat of physical or sexual violence. After completion of the program, it is our hope and goal that each woman recognize her own ability to chart and direct the course of her own life. EMPWR is currently provided at the Nebraska Correctional Center for Women in York, Nebraska. On Friday, August 24th, we graduated Cohort 79 from Life Skills/Re-Entry Prep!! “Friendly Fire” is a weekly conversation with Stu Kerns, Senior Pastor at Zion Church in Lincoln. Each Saturday morning at 7 am, Stu talks with local clergy, politicians, and news-makers about the news of the week in light of our faith. 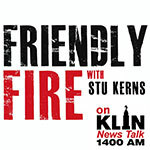 Listen to “Friendly Fire” Saturdays 7-8am on The Voice of Lincoln, 1400 KLIN. We would like to say thank you to the sponsors who matched funds and the donors who supported us financially for Give to Lincoln Day in 2018. Also, a BIG thank you to Lincoln Community Foundation and Firespring for hosting this awesome fundraising event every year!! Another awesome graduation in the books!! On July 20, 2018 these ladies were our 77th cohort to complete Life Skills/Re-Entry Prep!! On June 4th, 2018, we had the privilege of graduating seven ladies from our first EMPWR class at Nebraska Correctional Center for Women. Words cannot describe the outcome of this pilot program or how much joy we got out of getting to know this great group of ladies and watching them grow into a strong community focused on empowering each other and themselves. On June 29, 2018 we graduated Cohort 76 from our Life Skills/Re-Entry Prep program! On June 1, 2018 we graduated this great group of ladies as Cohort 74 of LSRP!! On May 18, 2018 we graduated this cool group of guys from Life Skills/Re-Entry Prep (LSRP)! Kerry, Ciara, and Claire (Nebraska Wesleyan University students) and Jodi (drives up from Crete!) were an amazing addition to our Job Readiness/Life Skills class at the Adult Detention Facility for the months of October and November. Thank you ladies for your dedication to Released and Restored! On August 29th we hosted a fundraising event for EMPWR at the home of Jan Brockley. It was a wonderful evening with a great turn out of supporters. We are truly grateful for everyone that came out to help make the event a huge success! During the event, Denise Davidson, Warden at Nebraska Correctional Center for Women in York, and two currently incarcerated women shared the importance and necessity of what this program will offer to help prepare incarcerated women for their successful and productive return to their children and society. A big THANK YOU to our hostesses: Jan Brockley, Dr. Gerise Herndon, Barbara Kohl, and Dr. Sue Wortmann. EMPWR will launch at Nebraska Correctional Center for Women (NCCW) in York, NE in January 2018. If you would like to make a donation to help support this program, please click on the Donate button below. We would like to give a VERY big thank you to FIRST PLYMOUTH CONGREGATIONAL CHURCH of Lincoln. The church collected items for Released and Restored during their Spring donation drive. Our office is now stocked with office supplies and other essential items that are needed to keep our program running on a daily basis. Words cannot express how grateful we are for the kindness and support shown through this donation and how much it helps our organization. On April 4th, 2017, Released and Restored launched its 20-week, Life Skills/Re-Entry Prep program, to men living in the Veterans Unit at the Nebraska State Penitentiary. We are delighted that we exceeded our expectations with 14 individuals signing up and participating in this program, which we normally cap at 12 individuals. These 14 men are fully engaged and very, very respectful of one another and of us. We are honored and proud to be working with these Veterans who have so nobly served our country. We look forward to building relationships with them, learning from them, and giving them hope and confidence for their future. For the months of February, March, and April, we have had the joy and privilege of having four students from Concordia University join us, for their service-learning project, as we provide our Jobs Readiness/Life Skills program at the Adult Detention Facility in Lincoln. Ashton, Justus, Liz, and Grady brought open minds, empathy, wisdom, and dedication to each and every class session. As of December 31, 2017: We have served 2195 individuals! Safe Haven continues to provide a weekly opportunity for safe and sober fun and fellowship for all who attend, participants and volunteers. Safe Haven meets every Saturday 6:30 – 9:30 p.m. Fans gathered o n August 27, 2013, at St. Marks Family Life Center to hear Ricky Simmons, former Husker football receiver (83) and NFL player talk a little about football and a lot about his life off the field. The event raised $5,000 for Released and Restored, a nonprofit working to provide inmates and ex-offenders with access to the tools and the support systems they need to learn how to live productive, moral, ethical, and legal lives in neighborhoods and communities. Ricky shared his story with about 200 supporters. Nearly 200 supporters listened to Simmons story of hope, recovery, and the importance of a network of support. Despite his traditional, hands-on upbringing by involved, highly educated parents, Simmons quit the NFL to be a full time drug addict, which led him to prison. A letter from Coach Tom Osborne inspired the motivation Ricky needed to recover and find renewed purpose in his life. Rickys story provided insight into the issue of prisoner re-entry back into the community. His story was followed by a question and answer session with Released and Restored Executive Director, Ruth Karlsson. Financial support was provided by sponsor AhRoma Coffee and numerous underwriters.